Recently, The Pew Charitable Trusts posted on its website Frequently Asked Questions about its role in the Barnes Foundation controversy. Friends of the Barnes Foundation responds below. Friends of the Barnes is dedicated to permanent preservation of the Barnes Foundation in its historic setting in Merion, Pennsylvania. We question Pew’s policy promoting the use of over $200,000,000 to erect a replica Barnes art gallery less than five miles away from the functioning, restored original. We believe that people of good will, who respect donor intent and understand the unique historical and cultural significance of the Barnes, can work together to keep the Foundation intact in Merion, as intended by its donor, Dr. Albert Barnes. The Barnes can be sustained financially in Merion by instituting sound management practices, expanding its attendance (supported by the local community) and undertaking a serious fundraising campaign. This would result in a secure institution without wasting hundreds of millions of dollars in taxpayer money and private philanthropy, which could be put to better use elsewhere. Pew would be celebrated by the arts, culture, and historic preservation communities around the world if it supported preservation, rather than replication, of the Barnes and honored the donor’s intent, just as it does with the legacy of the Pew family. 1) Q: Why is the Barnes Foundation moving? Pew response: The Barnes Foundation is moving its gallery from Lower Merion to Center City Philadelphia as the only feasible solution to severe and chronic financial problems. If these problems had remained unaddressed, the Foundation would have been unable to pay its bills. The physical security of the individual artworks and the integrity of the collection as a whole would have been at risk. FBF response: The plan to move the Barnes art collection was developed by Pew and other powerful interests in Philadelphia, who want a replica Barnes to be part of Philadelphia’s “museum row,” even though it already exists as a nearby, easily accessible cultural destination. (*1) Pew’s plan to use hundreds of millions of dollars to exploit the Barnes art collection as a “product” for Philadelphia tourism (*2) would destroy a cultural and historical resource revered throughout the world. Funding a shuttle bus to the Barnes would exhibit good stewardship and save over $150,000,000 in public and private funding. 2) Q: What is Pew’s role with regard to the Barnes Foundation? Pew response: Pew’s role has been as an advocate and fundraiser. We, along with other donors, helped to raise $150 million (which includes our own funds) to build a new facility in Philadelphia, relocate the collection and establish an endowment to ensure the Foundation’s future security. In addition, Pew provided interim operating support, enabling the Foundation to stay open in its Merion location. We acted not only to sustain the Barnes in the short term, but also to help put it on sound financial footing for generations to come, and as an independent institution accessible to all audiences, as Dr. Barnes wished. FBF response: Through its Agreement with the Barnes and Lenfest Foundations, Pew has underwritten the dismantling of the Barnes Foundation from the inside out. Pew has championed the move in the absence of any evidence that it would put the Barnes on sound financial footing. Oddly, although Pew conducts hundreds of studies every year, neither Pew nor any other entity has conducted a feasibility study to determine the financial viability or sustainability of a Parkway Barnes. 3) Q: How much has Pew contributed to the Barnes Foundation? Pew response: Pew has made grants totaling $24,350,000 to support the Barnes Foundation, which includes $20 million to support the costs related to the new facility. FBF response: Pew contributed over $1,000,000 for legal fees to break the Barnes Foundation Indenture of Trust. (*5) In addition, Pew has contributed to a disinformation campaign about the Barnes, misleading the public about its role in the move, misconstruing the intent of Albert Barnes, and obfuscating what the Barnes Foundation actually is. It is worth noting that an appropriation passed the Pennsylvania Senate in 2002 for Pennsylvania taxpayers to make a contribution of $107,000,000 to the project. (*6) All of the major parties involved, including Pew, deny having known about the appropriation. 4) Q: Was Pew’s involvement in the relocation of the Barnes Foundation gallery motivated by its desire to meet the public support test required to attain public charity status? Pew response: Pew’s role with the Barnes was neither motivated by nor necessary for our application to become a public charity. Our work with the Barnes Foundation was one of four examples we included in our Form 1023 petition of Pew’s ability to attract public support. The examples were chosen from a long list of qualifying projects. Pew qualified as a public charity irrespective of our work for the Barnes. 5) Q: Does Pew have any control of or governing role with the Barnes Foundation? Did Pew set out to take over the Barnes? Pew response: No. The Barnes Foundation is led by an independent board of trustees. The Barnes came to us after determining that its very existence was threatened and that it could not accomplish its mission or survive in its Merion location. We agreed, and provided much-needed support for its operations and long-term plan. Pew is not involved in operating the Barnes Foundation and we are not represented on the Barnes board. FBF response: Pew exerts its control and influence through money. In the Barnes case, Pew went further, actually requiring the right of final approval over Board members to “ensure the success of their charitable investment.”(*9) The formerly independent Barnes Trustees were nominated by Lincoln University, which was bought off with a pledge of $80,000,000 in taxpayer funds by Governor Rendell and the expanded Barnes Board left the Lincoln nominees in a minority role. (*10) The result is a stacked Board lacking fidelity to the Barnes Trust but instead fully committed to the goal of Pew, Rendell, and Philadelphia’s commercial interests to move the Barnes art collection to Philadelphia. 6) Q: Does Pew have any control or ownership of the Barnes Foundation’s artwork? Pew response: Absolutely not. Pew does not have any ownership of or control over the Barnes Foundation or its collection of artwork. Control over the assets and programs of the Barnes remains vested exclusively in its board. FBF response: Who controls the Barnes Board and the Barnes finances controls the Barnes artwork. (See number  above re: the Barnes Board.) A threat to the Barnes art collection was revealed in Pew’s 2002 Agreement with the Barnes, which requires a policy for lending artwork. This contradicts the stated intentions of Albert Barnes and is inconsistent with the educational mission of the Barnes Foundation. Note: Two major players in the plan to move the Barnes art collection are H.F. Gerry Lenfest, current President of Board of the Philadelphia Museum of Art and Raymond Perelman, who formerly held that post. 7) Q: Aren’t Pew and others being unfaithful to Dr. Barnes’s intentions by moving the collection? Pew response: Rarely reported, the governing document establishing the Barnes Foundation states that if the Foundation were no longer financially stable and needed to move, it would have the option to do so. The Montgomery County Orphan’s Court granted the Barnes Foundation request to relocate the art collection after years of litigation and weeks of hearings. The judge carefully reviewed the alternatives and agreed that the move to downtown Philadelphia was the best solution to the severe problems facing the Barnes Foundation. The Barnes Foundation is eligible to be a National Historic Landmark, the highest level of cultural and historical significance bestowed by the United States government, but only if it remains intact in Merion. 8) Q: Why didn’t Pew participate in The Art of the Steal, the documentary about the Barnes Foundation? Pew response: We learned that the film was going be severely biased. Given our institutional commitment to the facts and quality information, we decided it would be inappropriate to participate. FBF Response: The Art of the Steal is based on interviews with dozens of people and extensive research. It shows that a consortium of political, commercial, and philanthropic interests, including The Pew Charitable Trusts, worked together to violate the Indenture of Albert Barnes in order to move the Barnes art collection to Philadelphia. According to the filmmakers, their numerous invitations to Pew to participate were declined. (*17) Pew’s refusal indicates that they will not participate in a project over which they cannot exert control. 1- “Even before I got to the big wrought-iron gate, two myths had been shattered. The Barnes Foundation… is often portrayed as both hard to get to and the bane of its neighbors in Merion, a wealthy old suburb of Philadelphia. In fact, from 30th Street Station in Philadelphia, the train to Merion took precisely 11 minutes. From there, it was a short walk to the Barnes — and nearly every house I passed had the same sign on its lawn: ‘The Barnes Belongs in Merion’." Fred A. Bernstein, “Timeless Art Frozen in Time (for now),” The New York Times, June 23, 2006. 2- Moving the Barnes art collection is an essential part of Pew’s vision for Philadelphia. In a Wall Street Journal interview, Pew CEO Rebecca Rimel explained, “Philadelphia will keep its nose up if it has more product to offer." Rimel envisions a day when art-lovers will plan visits to Philadelphia and make side trips to New York, instead of vice versa. The Metropolitan Museum of Art and the Museum of Modern Art are rich, she concedes, ‘but there is no collection like the Barnes Collection.’" Judith H. Dobrzynski, Cultural Conversation with Rebecca W. Rimel : A Foundation Head Central to the Philadelphia Story, Wall Street Journal Online, February 8, 2007. 3- Memorandum Opinion and Order Sur Second Amended Petition to Amend Charter and Bylaws, January 29, 2004, p. 20. 4- "By letter dated June 18, 2007, Dr. Watson dismissed Montgomery County’s offer out of hand reaffirming the Barnes commitment, not to its indenture or fiduciary responsibilities, but to its “mission,” namely, the move to Philadelphia. Then, claiming that the Barnes has previously considered all “reasonable proposals presented to us,” Dr. Watson failed to set forth what was unreasonable about the proposal. Fiduciary responsibility requires the Barnes Board to explore proposals such as the financing plan presented by Montgomery County. In fact, the Barnes Board should have initiated that proposal.... Dr. Watson mischaracterized what has occurred to date as “binding commitments” which make the move of the gallery collection to Philadelphia “irreversible.” To the contrary, nothing that the Barnes Foundation has done is binding, nor is it irreversible. No architect has been selected. No city site is available. There are no architectural plans. There is no feasibility study. The fundraising is not complete. Costs continue to escalate. The Board is not in place. The Barnes cannot claim that it has relied on prior Court rulings to its detriment. An elementary understanding of fiduciary responsibility would have compelled Dr. Watson and his Board to explore Montgomery County’s offer as it was clear that this Court simply permitted the move as one alternative. It did not mandate the move." Petition to Reopen Proceedings, August 27, 2007, pp. 66-68, available here. 5- Rebecca Rimel testified in Court, “I am not familiar with the actual Indenture.” Testimony of Rebecca Rimel in Orphan’s Court, In Re: The Barnes Foundation, A Corporation, December 11, 2003, pp. 56-57. This is convenient, because anyone familiar with Dr. Albert Barnes’ intent for his foundation knows that the move is everything he would not want. 7- Internal Revenue Service Application of The Pew Charitable Trust for Public Charity Status, filed December 30, 2002. 8- Testimony of Rebecca Rimel in Orphan’s Court, In Re: The Barnes Foundation, A Corporation, December 11, 2003, pp. 29-30. 9- Agreement between and among the Barnes Foundation, the Pew Charitable Trusts and the Lenfest Foundation, September 13, 2002. p. 8. 10- See Patricia Horn, “The Deal of the Art,” The Philadelphia Inquirer, May 22, 2005. 11- “The Art of the Steal” a documentary film, produced by 9.14 Pictures: Sheena M. Joyce, Producer, Lenny Feinberg, Executive Producer, Don Argott, Director, 2009. Indenture of Trust of the Barnes Foundation (Article IX of the By-laws of the Barnes Foundation), December 6, 1922, as amended. 13 - There was no adversarial process, so the judge heard no testimony about the Barnes Board’s breach of fiduciary responsibility, its multiple conflicts of interest, or efforts to misappropriate the valuable Barnes art collection. 14- In his opinion, Judge Ott wrote: “The Attorney General, as parens patriae for charities, had an absolute duty to probe, challenge and question every aspect of the monumental changes now under consideration… The Attorney General was the only party with the authority to demand, via discovery or otherwise, information about other options. However, the Attorney General did not proceed on its authority and even indicated its full support for the petition before the hearings took place…. The Attorney General's Office merely sat as second chair to counsel for The Foundation, cheering on its witnesses. . . . [This] course of action . . . prevented the court from seeing a balanced, objective presentation of the situation, and constituted an abdication of that office's responsibility….” Memorandum Opinion and Order Sur Second Amended Petition to Amend Charter and Bylaws, pp. 20-21, January 29, 2004. Testimony of Albert C. Barnes, p. 1.From the case, Barnes Foundation v. Keely et al., Appellants No. 268 Supreme Court of Pennsylvania, January 30, 1934. Testimony in Arboretum Archives File in the Barnes Foundation Archives. 16- Letter from Jean H. Cutler, Director, Pennsylvania Historical and Museum Commission, Bureau for Historic Preservation, to Bernard C. Watson, Chairman of the Board, Barnes Foundation, January 19, 2010. 17- Scott Macaulay, “Art After Death,” Filmmaker, Winter, 2010. 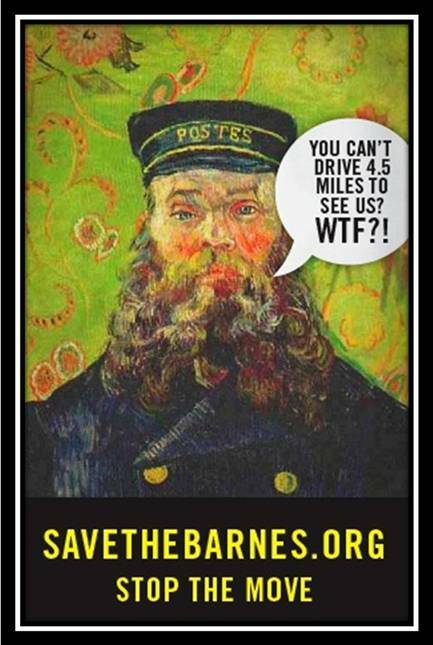 Help stop the move of the Barnes Foundation art collection. Join Friends of the Barnes Foundation at www.barnesfriends.org. Make a tax deductible contribution and make a difference.